I'm all geared up to watch the husb's final triathlon for this spring. He only scheduled two races so it is a short season, but a new venture altogether and I'm extremely proud of him! I am a big "sporter" as my niece used to say (and is now a running joke and what my family always calls sports fans, participants, etc.) so I get just as excited to go watch him compete as I felt when I was the one running in races. I put together an easy outfit that is essential to enjoying a full morning (we're talking leaving the house at 5:00 am!) of picking out the best spots to cheer on Matt and friends from the beach to the road to the finish line. It's important to have comfortable shoes, a lightweight jacket in the early morning, a bag to hold everything, and a camera to snap action pictures. 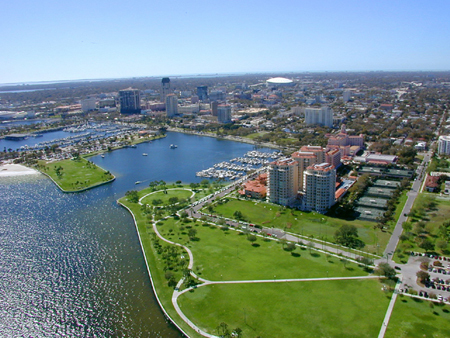 The location of the race is downtown St. Petersburg, FL and I'll be hanging around Vinoy Park much of the time to try to see most of the swim and run.